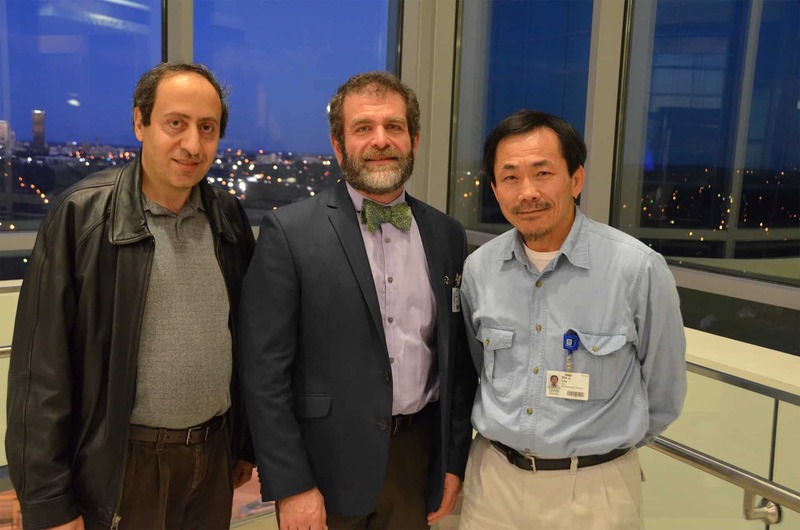 Seeds of Science research grant recipients (left to right) Abdallah Hayar, Ph.D.; Alan B. Diekman, Ph.D.; and Shi J. Liu, Ph.D.
Jan. 29, 2016 | Jan. 29, 2016 | Three UAMS scientists recently received start-up grants to advance their cancer research. The three grants of $10,000 each were presented to investigators at the UAMS Winthrop P. Rockefeller Cancer Institute by the Envoys, a volunteer advocacy group of the Cancer Institute Foundation, during their “Doctor is In” reception and research poster showcase Jan. 28. The grants are made possible by the Envoys’ annual RockStar Lounge fundraiser. This year’s event is set for April 21 at Club Level in Little Rock. Diekman’s project will evaluate whether serum titers of the carbohydrate-binding protein galectin-3 are elevated in men with localized prostate cancer, making it a possible biomarker for preventive screening tests. If Diekman’s hypothesis is correct, the measurement of serum galectin-3 titers could improve the commonly used serum prostate specific antigen (PSA) screening test. Hayar’s project will determine if specific chemotherapy drugs used for breast cancer affect physiological properties of neurons in the brain, resulting in impairment to memory, learning and spatial information processing. His results could aid in the development of clinical studies to improve the functioning of brain circuits adversely affected by chemotherapeutic drugs. Liu’s project will evaluate whether extracts made from the bark of the tropical tree Terminalia arjuna, which is known to have antioxidant properties, also has anti-tumor properties. The outcomes of the study could lead to identifying active components in drug development for the improvement of safety and efficacy in cancer chemotherapy. In addition to the grant presentation, the event included a research poster showcase in which UAMS cancer researchers displayed posters outlining their work and discussed their findings with guests.